Sympathetic activation increases when you experience excitement or stress whether physical, emotional, or cognitive. The skin is the only organ that is purely innervated by the sympathetic nervous system. Sympathetic activation (also Sympathetic arousal) increases when you experience excitement, or something important is happening or about to happen. It increases also with stressors - whether physical, emotional, or cognitive. In some medical conditions (e.g., epilepsy), it shows significant increases that are related to specific brain structures activation. 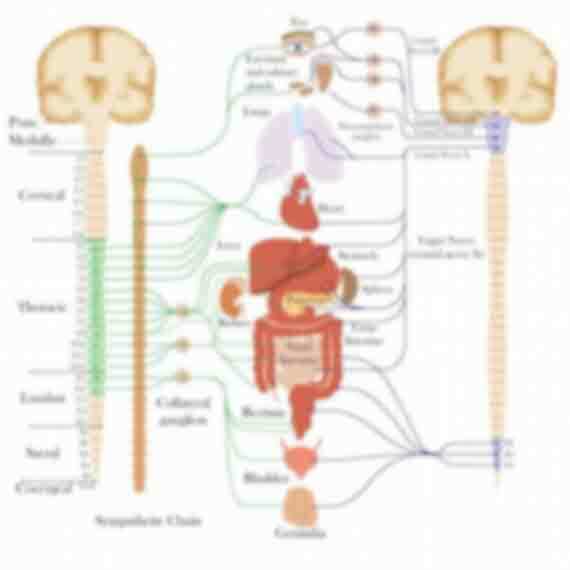 Parasympathetic activation occurs when your body needs to slow down and relax. It can be stimulated by the consumption of a hearty meal or deep breathing. How do we measure sympathetic activation? The skin is the only organ that is purely innervated by the sympathetic nervous system (and not affected by parasympathetic activation). We can observe increases in sympathetic activation by monitoring subtle electrical changes across the surface of the skin. Changes in heart rate (the time between the peak of each heart beat) occur as a result from both sympathetic and parasympathetic activation. Estimates of parasympathetic nervous system activation or vagal tone can be made by extracting the high frequency component of this heart rate variability. When the amygdala or hippocampus get activated, they elicit skin conductance on the same side of the body. . 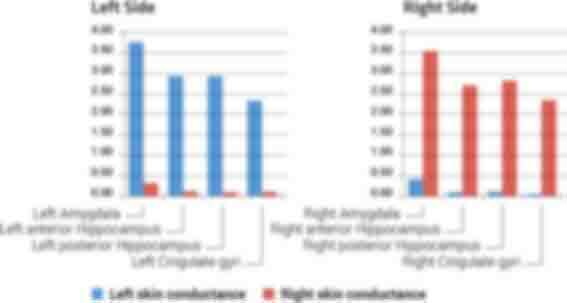 Stimulating four brain regions on the left and four on the right (with depth electrodes) produces large skin conductance on the same side. (Mangina and Beuzeron-Mangina, 1996). Also it is known that if a seizure strongly stimulates the amygdala, it could cause both large EDA and cessation of breathing. (Dlouhy et al. 2015). The E4 wristband and our technology have shown remarkable potential in the field of epilepsy monitoring from clinical research. Empatica has designed a system support real-world applications for seizure detection and characterization. Empatica is running a clinical trial, open to Embrace users, to collect and validate biometric signals from epilepsy patients using the Empatica Embrace watch and Alert app and compare them to e-diary seizure report information. Trial participants will provide context around seizure detections, false alarms, and seizures that are not detected by the system under challenging real-world conditions. The data gathered will support characterization of classifier performance and expose areas for improvement. EDA + motion is better than motion alone for automated Grand mal (Generalized Tonic Clonic) seizure detection (Poh et al., 2012a) . Also, larger EDA correlates with longer post-ictal generalized EEG suppression (PGES) (Poh et al., 2012b) . Starting from Poh's study, researchers at Empatica are constantly improving the algorithm for seizure classification. Their work leads to the following contributions: Regalia et al. 2015 and Onorati et al. 2016 . 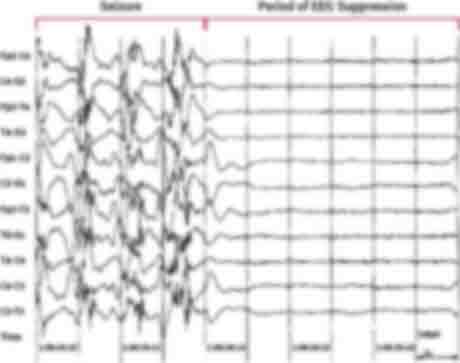 PGES (Post-ictal generalized EEG suppression) appears as a "flat" EEG following the seizure. PGES was found in 100% of the monitored cases of SUDEP (Ryvlin et al., 2013) . Thus, PGES is as an important biomarker for SUDEP. The duration of PGES correlates with the size of the EDA measured on the wrist. Thus, EDA can be used both as an indirect biomarker for SUDEP and a measure of autonomic disruption. Age is a significant determinant of the sympathetic and parasympathetic response following a Grand Mal Seizure; given the same PGES duration, paediatric patients demonstrate stronger sympathetic activation and higher vagal suppression. (Sarkis et al. 2015) . Van Dooren et al. (2012) demonstrate correlations between EDA responses across a number of dermatomes. The work shows that despite the amplitude being lower on the vertical wrist, the EDA signal is still discernible and shows clear skin conductance responses with stimuli. Poh et al. (2010) describe the relationship between traditional palmar wrist placement of EDA recording devices with dry electrodes measured during three conditions: physical activity, emotional stimuli, and high cognitive load. Ambulatory EDA sensors using dry electrodes and placements on the wrist or ankle have been validated not only in the epilepsy/medical journals listed above, but also in a growing number of other areas. Here is an example showing reasonable EDA data collected on the ankle, with comparison to the wrist (Fedor et al., 2014) . Picard et al. (2015b) described how a theory of multiple arousals explains asymmetric EDA findings. Pieper and Laugero used features extracted from Q Sensor data for their publication on emotional eating in the journal Appetite (Pieper et al., 2013) . AutoEmotive: Bringing Empathy to the Driving Experience to Manage Stress (Hernandez, Javier, et al., 2014) . Sano et al. (2014) show, during sleep measurements, that measurement of EDA on the wrist typically gives greater responsivity than measurement on the traditional palmar surface. Dlouhy, B. J., Gehlbach, B. K., Kreple, C. J., Kawasaki, H., Oya, H., Buzza, C., … Richerson, G. B. (2015). 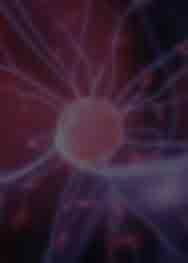 Breathing Inhibited When Seizures Spread to the Amygdala and upon Amygdala Stimulation. Journal of Neuroscience, 35(28), 10281-10289. doi:10.1523/JNEUROSCI.0888-15.2015 Abstract BibTeX . Dolgin, E. (2014). Technology: dressed to detect. Nature, 511(7508), S16-S17. doi:10.1038/511S16a, Abstract, BibTeX. Abstract BibTeX . Fedor, S., & Picard, R. W. (2014). Ambulatory EDA: comparisons of bilateral forearm and calf locations. Poster Session of 54th Annual Meeting of the Society for Psychophysiological Research (SPR), Atlanta, Georgia - September 10-14, 2014. PDF, BibTeX. PDF BibTeX . Fusco, A., Locatelli, D., Onorati, F., Durelli, G. C., & Santambrogio, M. D. (2015). On how to extract breathing rate from PPG signal using wearable devices. In Biomedical Circuits and Systems Conference (BioCAS), 2015 IEEE (pp. 1–4). IEEE. Abstract, BibTeX. Abstract BibTeX . Hernandez, J., McDuff, D., Benavides, X., Amores, J., Maes, P., & Picard, R. W. (2014). AutoEmotive: bringing empathy to the driving experience to manage stress. Proceedings of the Companion Publication on Designing Interactive Systems, (DIS '14) Vancouver, BC, Canada - June 21-25, 2014. doi:10.1145/2598784.2602780, Abstract, PDF, BibTeX. Abstract PDF BibTeX . Mangina, C. A., & Beuzeron-Mangina, J. H. (1996). Direct electrical stimulation of specific human brain structures and bilateral electrodermal activity. International Journal of Psychophysiology, 22(1/2), 1-8. doi:10.1016/0167-8760(96)00022-0, Abstract, BibTeX. Abstract BibTeX . Micoulaud-Franchi, J., Kotwas, I., Lantenaume, L., Berchet, C., Bastien, M., Vion-Dury, J., McGonical, A., & Bartolomei, F. (2014). Skin conductance biofeedback training in adults with drug-resistant temporal lobe epilepsy and stress-triggered seizures: a proof-of-concept study. Epilepsy & Behavior, 41, 244-250. doi:10.1016/j.yebeh.2014.10.017, Abstract, PDF, BibTeX. Abstract PDF BibTeX . Nagai, Y. (2011). Biofeedback and epilepsy. Current Neurology and Neuroscience Reports, 11(4), 1-8. doi:10.1007/s11910-011-0201-3, Abstract, BibTeX. Abstract BibTeX . Onorati, F., Regalia, G., Caborni, C., & Picard, R. (2016). Improvement of a convulsive seizure detector relying on accelerometer and electrodermal activity collected continuously by a wristband. Presented at the 2016 Epilepsy Pipeline Conference, San Francisco, California - February 25-26, 2016. Abstract, BibTeX. Abstract BibTeX . Picard, R. W., Loddenkemper, T., Reinsberger, C., Sarkis, R., Dworetzky, B., Lai, M., Tognetti, S., Picard, L., Surges, R., Friedman, D., French, J.A., & Devinsky, O. (2014). Crowd-sourcing a scientific study to understand autonomic disruption in epilepsy. Poster session at the Partners Against Mortality in Epilepsy Conference, (PAME '14) Minneapolis, MN - June 19-22, 2014. PDF, BibTeX. PDF BibTeX . Picard, R. W., Devinsky, O., Dworetzky, B., French, J.A., Friedman, D., Lai, M., Loddenkemper, T., Poh, M. Z., Reinsberger, C., Sarkis, R. A., & Surges, R., (2015). The importance of measuring autonomic data in new epilepsy treatments. Epilepsy & Behavior, 46, 54-55. doi:10.1016/j.yebeh.2015.02.053, Abstract, BibTeX. Abstract BibTeX . Picard, R. W., Fedor, S. & Ayzenberg, Y. (2015). Multiple Arousal Theory and Daily Life Electrodermal Activity Asymmetry. Emotion Review, 1-14. doi:10.1177/1754073914565517, Abstract, PDF, BibTeX. Abstract PDF BibTeX . Pieper, J. R., & Laugero, K. D., (2013). Preschool children with lower executive function may be more vulnerable to emotional-based eating in the absence of hunger. Appetite, 62(1), 103-109. doi:10.1016/j.appet.2012.11.020, Abstract, BibTeX. Abstract BibTeX . Poh, M. Z., Loddenkemper, T., Reinsberger, C., Swenson, N. C., Goyal, S., Sabtala, M. C., Madsen, J. R., & Picard, R. W. (2012 a). Convulsive seizure detection using a wrist-worn electrodermal activity and accelerometry biosensor. Epilepsia, 53(5), e93-e97. doi:10.1111/j.1528-1167.2012.03444.x, Abstract, PDF, BibTeX. Abstract PDF BibTeX . Poh, M. Z., Loddenkemper, T., Reinsberger, C., Swenson, N. C., Goyal, S., Madsen, J. R., & Picard, R. W. (2012 b). Autonomic changes with seizures correlate with postictal EEG suppression. Neurology, 78(23), 1868-1876. doi:10.1212/WNL.0b013e318258f7f1, Abstract, BibTeX. Abstract BibTeX . Poh, M. Z., Swenson, N. C., & Picard, R. W., (2010). A wearable sensor for unobtrusive, long-term assessment of electrodermal activity. IEEE Transactions on Biomedical Engineering, 57(5), 1243-1252. doi:10.1109/TBME.2009.2038487, Abstract, PDF, BibTeX. Abstract PDF BibTeX . Regalia, G., Onorati, F., Migliorini, M., & Picard, R. (2015). 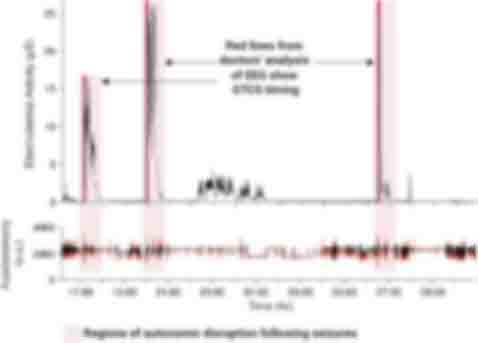 An improved wrist-worn convulsive seizure detector based on accelerometry and electrodermal activity sensors. Presented at the American Epilepsy Society Annual Meeting. Abstract, BibTeX. Abstract BibTeX . Ryvlin, P., Nashef, L., Lhatoo, S. D., Bateman, L. M., Bird, J., Bleasel, A., Boon, P., Crespel, A., Dworetzky, B., Høgenhaven, H., Lerche, H., Maillard, L., Malter, M. P., Marchal, C., Murthy, J. M., Nitsche, M., Pataraia, E., Rabben, T., Rheims, S., Sadzot, B., Schulze-Bonhage, A., Seyal, M., So, E. L., Spitz, M., Szucs, A., Tan, M., Tao, J. X., & Tomson, T. (2013). Incidence and mechanisms of cardiorespiratory arrests in epilepsy monitoring units (MORTEMUS): a retrospective study. The Lancet. Neurology, 12(10), 966-977, doi:10.1016/S1474-4422(13)70214-X, Abstract, BibTeX. Abstract BibTeX . Sano, A., Picard, R. W., & Stickgold, R. (2014). Quantitative analysis of wrist electrodermal activity during sleep International Journal of Psychophysiology: Official Journal of the International Organization of Psychophysiology, 94(3), 382-389. doi:10.1016/j.ijpsycho.2014.09.011, Abstract, BibTeX. Abstract BibTeX . Sarkis, R. A., Thome-Souza, S., Poh, M.-Z., Llewellyn, N., Klehm, J., Madsen, J. R., … Reinsberger, C. (2015). Autonomic changes following generalized tonic clonic seizures: An analysis of adult and pediatric patients with epilepsy. Epilepsy Research(115), 113-118. doi:10.1016/j.eplepsyres.2015.06.005, Abstract, BibTeX. Abstract BibTeX . Van Dooren, M., De Vries, J. J., Janssen, J. H. (2012). Emotional sweating across the body: comparing 16 different skin conductance measurements locations. Physiology & Behavior, 106(2), 298-304. doi:10.1016/j.physbeh.2012.01.020, Abstract, BibTeX.  Abstract BibTeX PDF .